I really hate typing that because I know my weekend is almost over. It just goes so fast! Only if the work week would go that fast. Well I am recovering fine from my root canal. I’m a little sore but no big deal! I didn’t even take the prescribed medicine. I really don’t like taking any kind of medicine if I don’t have to. Funny though, when you need to eat softer type foods I tend to gravitate towards foods I can’t eat like Pizza, Hamburgers, Pita Chips, Pretzels, Nuts and more. I rarely even eat that type of food! It’s all in my head I know! Well I tempted to try chicken for dinner and it worked. I made it moist enough that it didn’t hurt to eat it! yeah!! That’s a recipe I’ll share with you soon!! So Saturday night, I made another flop dessert. This time I won’t share a picture with you because it is, well, ugly! I wanted something sweet that I could chew and I saw a tub of cool whip in the fridge, so I thought Chocolate Silk Pie. Well, I checked my cupboards and I had a box of Sugar Free Chocolate pudding, but it was cook and serve, not instant. I made it according to the directions on the stove top, and I set it aside to cool. Well I didn’t let it cool enough and I mixed in half a tub of cool whip. The chocolate just ate it right up! I debated about throwing it out, but I tasted it and it was good. Creamy Chocolate! So I put it in my homemade graham cracker crust, and topped it with the remaining cool whip. Refrigerated it for 3 hours and I thought doesn’t look bad. Then I cut it and it was really like a pudding mess! But a mess that was very yummy tasting. I’ll try the recipe again, but do it up a little better with some added twists, then I will share it with you. Don’t you hate when you make flops? At least this one won’t get wasted. Well now that I rambled on and on, I shall talk about today’s recipe! So what’s for breakfast? Remember that big batch of butternut squash I made? First let me tell it was the best big batch ever, I ate it everyday! For lunch, as a dinner side and even snacking on it cold. Well, I made the most awesome breakfast with it. I liked it so much I bought another butternut squash so I can make it again! Oh your wondering what the heck I could make for breakfast with butternut squash? Just see for yourself. I made a Butternut Squash Frittata. Oh my was it good. It almost reminded me of my butternut squash pizza I made a while back! 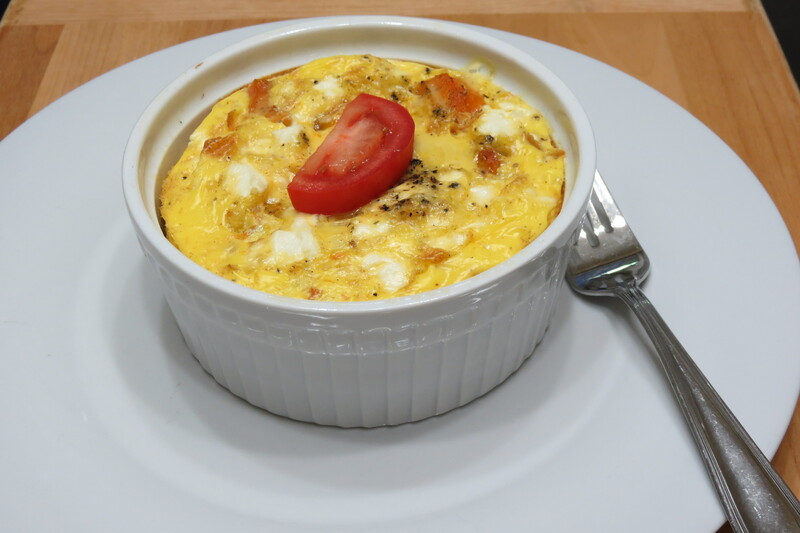 This little egg dish was so quick and easy. I took a 10 oz. 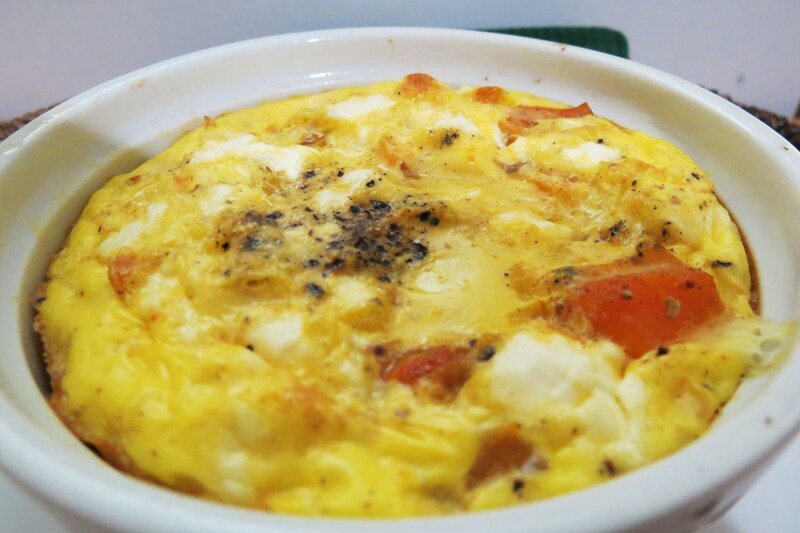 Ramekin, sprayed it with cooking spray, added 1 cup squash, 2 eggs, milk and goat cheese. Bake for 35 minutes and it was all done! What was nice about this dish, is that it filled me up for about 4 hours. I love having a hearty breakfast, meaning no snacking in the morning! If you were to have some toast, maybe some bacon, you could easily split this with another person, but then again, it tasted so good, why would you want to? In a measuring cup add your eggs and milk. Mix until combined. Pour over butternut squash. Sprinkle with pepper and top with cheese. NOTE: To make roasted butternut squash, I peeled butternut squash, cut in to bite size pieces, place on a sprayed baking sheet, add 1/4 cup sliced onion, 1/2 tbsp. olive oil, salt, pepper, cinnamon and a pinch of Cayenne Pepper, mix together with your hands. Bake in a 400 degree oven for 15 minutes, flip the squash and bake for another 15 minutes. You can go to this link to see a step by step on how I did it. Here’s a picture to give you an idea what the inside looked like. Not a great shot! One thing I do love about the weekend is breakfast. It’s so nice to be able to take the time to make something yummy! During the week, it’s normally, microwaved eggs, oatmeal or yogurt. Nothing exciting! 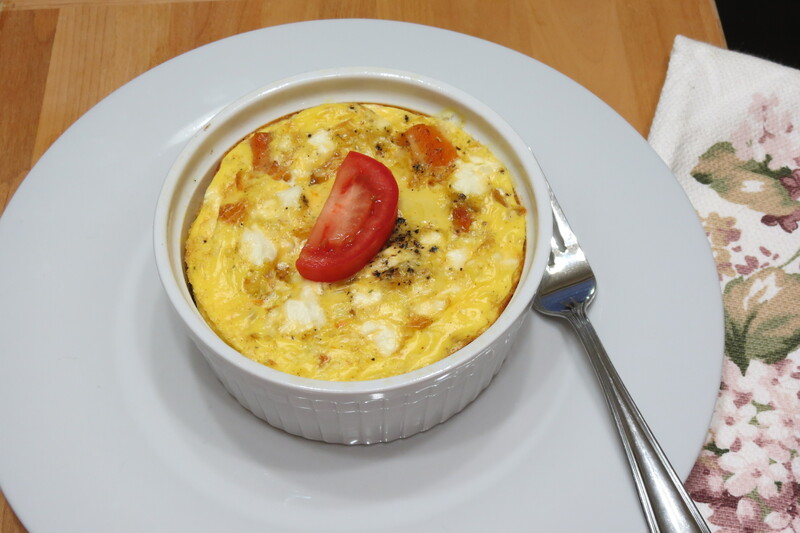 Did you know you could make an egg dish just like this, but place them in a muffin pan and bake them. Then you have a grab and go breakfast for a few days. Whats your favorite meal of the day? For me definitely breakfast! I love it all eggs, waffles, muffins, croissants, oatmeal, bacon, toast, pancakes and left over cold pizza! 🙂 Yum! I’m already thinking of tomorrows breakfast and I think I am feeling pancakes coming on!! But what kind?? Now go make yourself a wonderful breakfast and start your day off right! Have a great day!!! Oh, one last thing, if your interested, I updated the Trader Joe’s page with a few more items. I must try this-it looks amazing! I’m so glad you are recovering well from the surgery….I hate mouth surgeries-yuck! I get my wisdom teeth out next week (eeek! ), so I will remember this soft recipe. Good luck next week! I need to get my wisdom teeth out sometime this year! I’m not looking forward to it! Eck!! Your blog looks great! I’m happy that you are enjoying the b’nut squash recipe. It’s always fun to re-purpose things into new recipes too. Thanks Angela, that means allot coming from you! 🙂 I made your Chocolate Chip Cookie Dough Balls today! They always satisfy my sweet tooth! 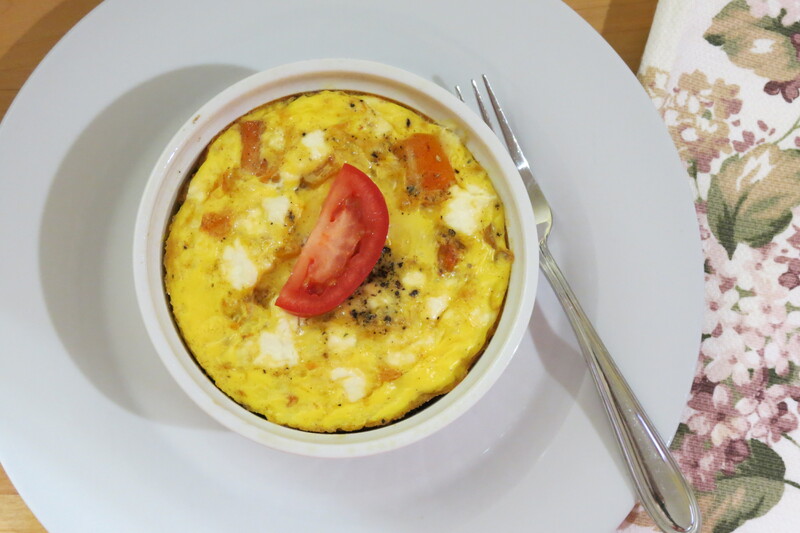 Fritata is a frequent and favorite breakfast on this house and adding the squash sounds like a great idea to us! 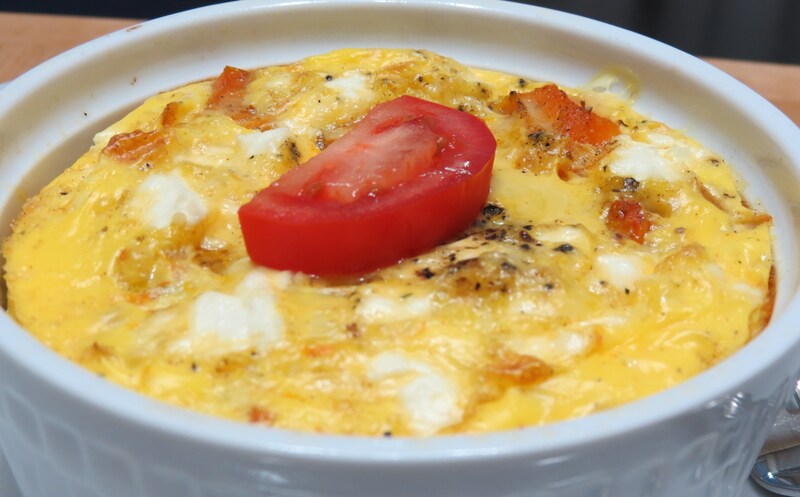 OR for lunch… OR dinner… great recipe! Thanks! 🙂 I was surprised on how well it turned out! 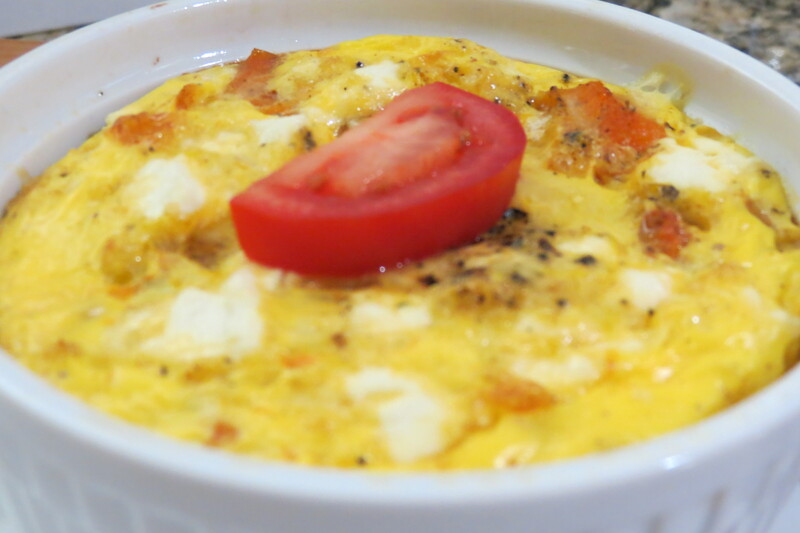 It’s my new favorite egg bake! This would definitely satisfy any meal you choose!! This really looks delicious! Boy would my kids love to have you for their Mom or maybe their nanny because you are always cooking up something tasty & nutritious (plus you’re lots of fun too!) The yogurt parfaits with granola, oatmeal, quiche, blueberry pancakes & scones among many other things. Heck, I could use some better nutrition myself! I haven’t been cooking much at all this past year because my kitchen just isn’t conducive & lately I’ve been on a lousy schedule because of work. I am lacking energy because of my diet & the boys need better nutrition because they are growing. Thanks for all the helpful tips though ~ I’ll pull it together one of these days. 🙂 Love you! Sneaky! I love butternut squash and goat cheese, and the squash makes the meal more complete, love it! thanks for sharing with us on Allergy Free Wednesdays! wow – i am so excited to read through your blogsite. 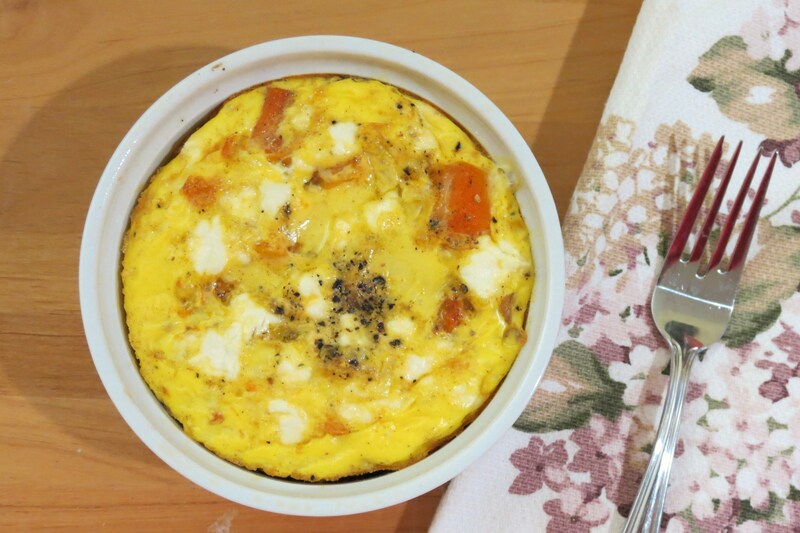 This egg recipie looks great! I am anticipated starting a new phase of my healthy lifestyle, including low sugar and low carbs for 3 wks, so several of your recipies seem to fit the bill. Thanks so much for your postings! 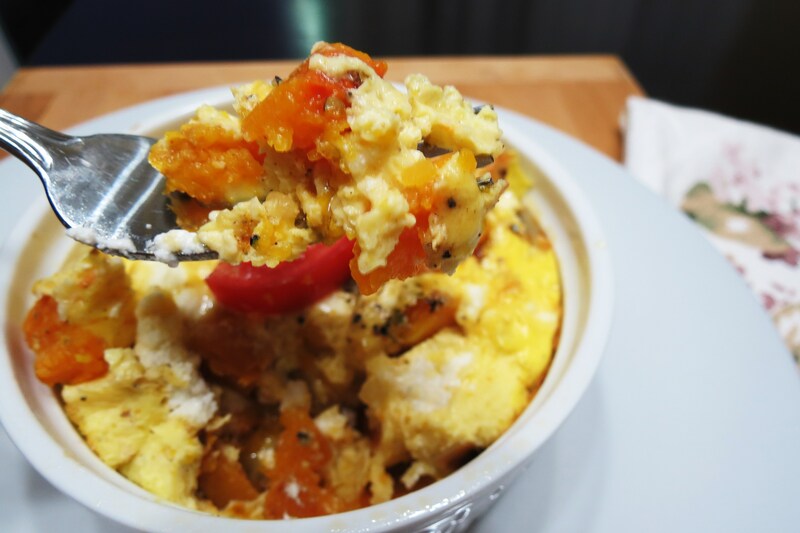 I have to tell you this is my favorite egg dish! I save butternut squash from dinner, just so I can make this for breakfast! I hope you enjoy it! Also, good for you on starting a healthy lifestyle! I started mine about 2 – 3 years ago and I feel so much better inside and out!! I just wanted to share that Silk and pudding mixes do not set up. I have made that same mistake along with several other of my friends. Not sure if it needs something in regular milk to help it congeal. Ours just stayed liquid.